It’s news to no one that the Northwestern United States is a relative hotbed of musical talent. In the early ’90s, it was grunge god Kurt Cobain who introduced the world to the brooding sounds of the cold left coast. Since then, bands like Modest Mouse, the Shins, Death Cab for Cutie, and the Decemberists have kept the scene alive, taking hints from their predecessors as they mold the future of indie rock. Currently, the area is once again attracting attention, thanks to the music-makers who call it home. All along the Pacific seaboard, bands like Portland’s Fleet Foxes, Berkley’s Howlin’ Rain, and Seattle’s Band of Horses are garnering critical acclaim (and gaining industry momentum) thanks to their alt-country-meets-folk-revival-meets-Southern-rock soundscapes. These shaggy-faced neo-hippies are succeeding by way of homage, melding musical influences into sounds that are altogether new and yet undoubtedly American. Last summer, Portland’s Blitzen Trapper was the newest to join these ranks. With their third disk, Wild Mountain Nation, the sextet turned some big-name heads, drawing comparisons to everything from Pavement to the Beatles to Simon & Garfunkel and scoring themselves a lucrative record deal with Sub Pop. Since then, it’s been all touring and recording for the guys, resulting in the highly anticipated release of the band’s fourth disk, Furr, in September. This Monday, December 1, the boys of Blitzen Trapper will head to Muddy Waters Cafe for a special night of music. Below, the band’s frontman and lead songwriter, Eric Earley, answers a couple of questions from the road. It looks like the six of you are touring straight through the Thanksgiving holiday. How will you celebrate Turkey Day on the road? I don’t know. I think we might stay in Austin [Texas] or something. We’ll be driving, so we’ll see. We haven’t made any plans, but I’m sure it will be fabulous. How have things changed from the band’s first tour to now? It’s pretty much the same [laughs]. I guess it’s a little bit more comfortable, but not really. We’re playing better clubs, maybe. When did you first start making music? What was growing up like for a youngster in Salem, Oregon? I started playing when I was a little kid – my father was a musician. I was maybe six or seven when I started playing. And what was it like growing up in Oregon? I guess it was good. There weren’t many people there. There wasn’t a whole lot of anything there, I guess. We used to ride our dirt bikes around, go camping, go fishing. That was about it, really [laughs]. We played music. I know you came from a fairly musical family. What do the relatives think of Blitzen Trapper’s tunes? My mom seems into it. She likes to collect pictures of me. What were they listening to when you were growing up? A lot of folk music. My mom loves Joan Baez. My dad listened to bluegrass, and then Bob Dylan and all that; mostly a lot of American music. Currently there seems to be a whole set of bands from the Northwest who share a definitely a certain “feel” to their musical style. What is it about the region that you find yourself drawn to? Is there anything in particular that you could pinpoint as a musical influence? I mean, it’s hard to say. I know that that region has been pretty isolated, especially in the 80s and 90s, and it was pretty economically depressed for a long time – I mean, it still is, but: I think maybe that had a lot to do with it. As a kid, the musical stuff going on was really the grunge movement in the 90s. We were all kids during that. I think there’s a sense of isolation there – at least there was when I was younger. The weather’s pretty dark and it lends itself to sort of working on your own thing without distractions. Also, you’ve got all the different aspects of the country [there]. You’ve got the oceans, you’ve got the mountains, you’ve got the desserts, and it’s all pretty close. So growing up we’d go out to the dessert and go rafting and things like that. And in the winter we’d go up to the mountains and it would be snowing. You sort of get this well-rounded experience of the outdoors, I think. You’ve released two gorgeous, but very different albums in the span of less than two years. What was that process like? Do you write a lot on the road? Well we’re in our own studio, so we’re just kind of making records leisurely without much thought of the future. I mean, with Wild Mountain Nation we weren’t touring at all, so I just kind of made that over a couple months. With Furr, I made that over about seven months, but I did it in between being on the road. In between Wild Mountain Nation and Furr you managed to tour the globe, score a record deal, and get a whole lot of critics talking. Was there a lot of pressure that came along with the second release? Yeah, not really. If there was, I didn’t really feel it [laughs]. Was SubPop happy with the finished product? Yeah, they seem to be. I mean, they’re happy when things go well and they make money, right? [Laughs.] No – yeah, they were happy with the record from the get go I think. I’ve read that you guys adopted quite a beater of a piano during the recording of this last album. Is equipment and gear collecting a big deal to any of the guys in the band? I guess I kind of am and Mike, our bass player is. All the studio gear is all our stuff pretty much. The piano we just kind of found in the hallway where we were recording. I’m not really sure whose it was. We don’t have it anymore – we just left it there when we were done. I’m sure someone else is banging on it. Or maybe they dismantled it, I have no idea. What’s this mystery studio like? Well, we had a rehearsal space in there that was these two rooms that were kind of joined together, and we just put the studio together in there. We brought in all the stuff that you’d need, and it’s been set up like that for a couple years. There were other bands that would rehearse during the day there, below us or beside us or whatever. But a lot of the recording was done in the middle of the night when it was empty, and it was in the warehouse district, so there weren’t that many people, just hookers and crack heads. Do you have a favorite piece you’ve acquired or held onto? Well, I’ve got my dad’s guitar, which was his brother’s. It’s really old. It’s from the mid-to-early 60s, an acoustic. That’s the only instrument I have that’s been passed down. That’s not true. I also have a banjo that was my dad’s. But I don’t tour with those things. Any horror stories from this last leg of touring that you’d like to share? A couple tours ago, we were driving in Southern California and we drove over something in the middle of the night, going up over a pass going into California. A piece of metal basically just sheared off the gas tank and all the gas leaked out and we didn’t know it. So we stopped at a gas station to fill up because suddenly the gas was gone, and so we start pumping gas and it just starts gushing out the bottom of the van all over the ground. It was probably like two in the morning out in the middle of Eastern California. It was kind of fucked up. We got duck tape and some rags and kind of stuffed some stuff in there and drove for a while. It didn’t work. It was kind of like MacGyver, basically. You guys have kind of been moving at breakneck speed since the release of Wild Mountain Nation. 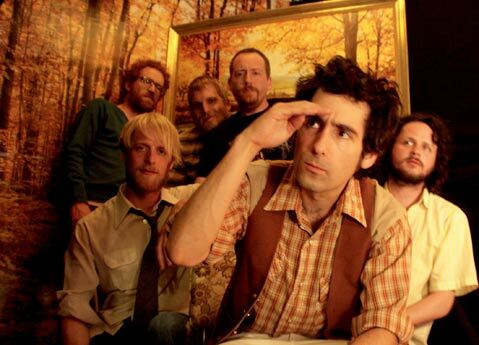 What’s next for Blitzen Trapper? We’re taking a break for the holidays. We’re gonna drink some eggnog, drink some cider, some gluvine. We might do some recording in January, then we have another tour at the end of February. I think I’m going to be in L.A. for Christmas because I have some family down there now. I might go ice skating in Pershing Square. I might go to Mexico too. My mom lives there now, so I have to go down there at Christmas, which is not thrilling for me, honestly. Oregon Christmas is kind of nice. Maybe I’ll ditch out early and leave on a midnight train to Oregon [laughs].